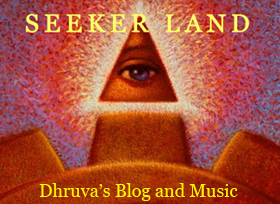 Seeker Land: Is Obama A Sociopath? Like a cough, a sociopathic mindset, cannot be hid. "If you like your health care plan, you'll be able to keep your health care plan, period. No one will take it away, no matter what." That's what President Obama said over and over again in one form or another. He said this well beyond the 2010 meeting with Republicans (which is on video) where he agreed with Congressman Eric Cantor that millions would lose their plans. He intentionally deceived millions of Americans on a matter of critical importance to them, their health. Like a con-man, he lied to get what he wanted with reckless disregard of the consequences for millions of Americans. Obama also knows that his healthcare website is a goldmine for hackers. Security experts emphatically tell congress it is not secure. Yet, Obama continues to implore millions of citizens, that he has sworn an oath to protect, that they should sign up...That is sociopathic. As the brave, yet horribly ill-equipped Kurds meet ISIS on the battlefield with only 6 bullets to each Kurdish man and woman fighter, Obama plays golf and enjoys lavish fundraisers. Why should we be surprised that he won't give the Kurds what they need to properly defeat ISIS's genocidal campaign, when Obama won't even keep his promise to call the Armenian genocide a genocide? He just doesn't care. Indifference is the essence of a sociopath. In this article you will see example after example of a callus disregard for people that only a sociopath could have. You will see a complete, pathological indifference to truth, life and even reason. During the government shutdown President Obama had armed guards barring veterans from their open air war memorials (in fact, it cost the government more to close these memorials and parks, like Mt. Rushmore, than it did to keep them open). Yet, Obama did not care to post enough guards to protect our murdered ambassador in Libya, even after Ambassador Stevens repeatedly begged the Obama administration for more protection. Obama was simply not concerned. In Bob Woodward’s book "Obama’s Wars", Obama is quoted: "We can absorb a terrorist attack. We'll do everything we can to prevent it, but even a 9/11, even the biggest attack ever...we absorbed it and we are stronger." Apparently, Obama thinks it's acceptable for Americans to die because we as a nation can take it, and we will get over it. Being able to absorb an attack is not the point to people who aren't sociopaths. Never having an attack is the focus. That was Bush's focus. He said we can't afford to make a mistake because the terrorists only have to be right once, like the Boston Marathon attack. That day, Obama did not call it terrorism, he called it a "Tragedy". Accidents are tragedies, not premeditated attacks. You don't put a murderer on trial for committing a "tragedy". That kind of disconnect from the true nature of these murderous events belies a mindset that denies rationality and reality. It disregards what's actually going on. Any reasonable, intelligent and ethical person would agree that, whether or not we should have invaded Iraq, once we were there, we had an obligation to leave it a better place. We should not just remove a tyrannical government and then leave a vacuum for chaos to fill it. That's what led to the Taliban and Al Queda in Afghanistan. So any reasonable, intelligent, and ethical person would have to agree that staying the course in Iraq was, and is, the right thing to do for all humanity concerned. Right?...Well, not Obama. Only after becoming president did reality force him to act somewhat ethically. During the most darkest days of the Iraq war, when violence was at an all time high, and the entire country was on the brink of collapse and all out civil war, the only thing standing between the vicious insurgents and the helpless, innocent Iraqis was the U.S. military...That's when Obama wanted to pull out. He knew full well, that if we abandoned this nation, which was already looking like a Mad Max movie, it would have crumbled into genocide. Millions could have been killed and displaced. Al Queda would have taken over central Iraq, Iran would have taken the south, and Iraq would have become a far greater problem than Afghanistan is. But Obama just didn't care. Seemingly, his insane rational was, we shouldn't have gone in, therefore we should pull out as fast as possible. That's like saying, if a cancer patient gets a cancer removed surgically (like Saddam's regime was removed), but then an infection sets in (the insurgency), you should NOT treat the patient with antibiotics (the U.S. surge) and close up the wound (reconciliation). We should just leave the gaping infected wound open to rot and let the contagion go airborne infecting the whole hospital (the free world) because it's just too much of a hassle to fix it and there's this other patient, Mr. Afghanistan. Fortunately, Bush got this patient to a more healthy place and walking on it's own. We know Obama is not stupid, so why would he suggest something so obtuse, unless...he just didn't care. That is the mark of a sociopath. His own feelings and agenda must be satisfied above ethics and reason. In 2007, when the troop surge was only halfway implemented, our soldiers were fighting in the 112 degree heat, getting wounded, watching their comrades die in constant heavy contact with the enemy. They would come back to their bases after a long day of fighting and what would they see on their T.V. screens? Obama, giving loud, fervent speeches about how the surge would never work and was doomed to failure. This, when it was only halfway manned and implemented. It hadn't even fully begun yet, and Obama was already out there demoralizing our troops and giving aid and comfort to the enemy at the same time. This is an astonishing act of betrayal. Obama always talks about his admiration and love of Lincoln. Well, Lincoln would have had Obama (and Harry Reid) shot or jailed for treason for doing what they did. "Congressmen who willfully take actions during wartime that damages morale and undermine the military are saboteurs and should be arrested, quickly tried and hanged! "-ABRAHAM LINCOLN. While Obama was out there barking that General Petraeus was going to come back to Washington to tell us what a failure Bush's surge was...Old Abe was rolling in his grave. The policies Lincoln had in place to maintain support for his war effort made the Patriot Act look the Magna Carta or the charter for the ACLU. It's one thing, to wait a couple weeks to see if a fully implemented strategy is working, and if it isn't, to then criticize it. Or, as well, to quietly, behind the scenes explain your objections and concerns. But to jeopardize a critical operation by demoralizing our own troops, obfuscating facts, and emboldening our enemies, for mere political gain, is selfish beyond the pale. Again, this is the mark of a sociopath. We now know Obama was flat wrong about the surge, but I wonder if he ever stopped once to think about how his actions might make things harder for our soldiers and the Iraqi people. At the same time, Obama stated that he would negotiate unconditionally with holocaust denier Ahmadinejad, President of Iran. Did Obama stop to think how that would effect the morale and efforts of the reformers in that country? Then what happens next? Russia invades Georgia. It is clear cut case of baseless aggression of one police state attacking a healthy democracy. So what does Obama do? While McCain immediately condemns Russia and rallies in support of Georgia. Obama stands back and simply says, both sides need to cease hostilities, as if there was some moral equivalence between the actions of the de facto dictator Putin, and the fledgling democracy of Georgia. Obama showed no empathy for the savaged Georgia until days later when it became politically expedient for him to follow McCain's lead in condemnation of Russia. When Obama makes no moral distinction between Georgia and Russia, this accommodates Putin, a tyrant who kills and jails his political opponents and reporters that criticize him. As well as shuts down free media. This is the exact same behavior Obama had to the ongoing revolts in Iran. At first, he had no harsh words for the tyrannical Iranian regime that was killing protestors in the streets. He said we don't want to be perceived as meddling in Iran's affairs (as if we were getting these protesters started). This is an incredibly cynical statement. After all, the protestors know this is a grass roots rebellion, and the Iranian government knows it's a grass roots rebellion, so who the hell is Obama worried about perceiving us as meddling if we voice our support for the reformers? Since when is encouraging freedom not a good policy? Regan said to Gorbechev "Tear down this wall". Those four words galvanized the Eastern Berliners to do just that. The Iranian reformers don't think we're meddling, only the bad guys do. No matter what we do, the Iranian government is going to do whatever it wants to, so why not help the reformers change things? Again, Obama just doesn't seem to care enough. Obama's weak, even nonexistent support for the protestors only accommodates the totalitarian Iranian government. These protestors, by the way, were holding up signs in English, which is a clear indication that they are asking for the support (not the meddling) of the U.S. and the west. Obama, however, left them high and dry because, again, his own political fantasy and ego trip of thinking he can sweet talk the Mullahs into an agreement to give up nukes supersedes ethics and reason. The Iranian zealots can't even stick to their own election laws and Obama thinks they are going to stick to an agreement they make with the black infidel? Not only is Obama a sociopath, but he is seriously deluded. Let's look at who else Obama has decided to accommodate. 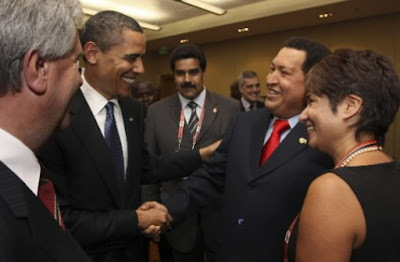 He gladly shook hands with Hugo Chavez who is trying to control all media, violently remove his opponents, and make himself President of Venezuela for life. Just before their meeting, Chavez called Obama a "poor ignoramus". Surely that deserves a handshake. Obama gave legitimacy to this thug in front of the cameras while accepting an anti-American book from him. The sales of the book hit the roof. It went from 54,295th on Amazon's bestseller list to # 2. In one televised moment Obama was used and owned by this Latin American strong man. Bill Maher used to call Bush a "rube" on the world scene. Well Bush would never let himself get punked by any dictator,and he was smart enough to know that "unconditional" negotiations with Iran would never work, unlike Obama, so who is the real rube here? If Obama had real empathy for the Venezuelans that want true freedom, he would not have been caught dead in a smiling, hand clasp with this dictator. But Obama, again, doesn't care about the morale of the reformers in Venezuela. Just like he didn't care about sitting through an hour long Anti-American diatribe by socialist Nicaraguan President Daniel Ortega (friend of Putin, Castro and Chavez), accommodating him as well. 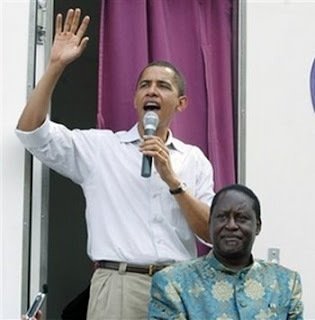 And why on Earth would Obama befriend and support Raila Odinga, Prime Minister of Kenya who made a pact with Kenyan Muslims to institute sharia law, named his first son after Fidel Castro, and who let his tribal followers go on murderous rampages to install him in power? On top of all that, Obama supported ousted Honduran President Manuel Zelaya. This guy, like Chavez, was trying to extend term limits to be president. Both the Honduran Supreme Court and Congress said this was illegal. So they kicked him out, and Obama called it a coup. A coup is usually done by some strong arm military dictator against the will of the people. In this case however, it is the people's own representatives, the congress, unified with the supreme court that ousted the guy. But Obama is not on the side of the people's representatives, no, he's on the side of the guy who is trying to become a dictator and claims that “Israeli mercenaries” are torturing him with high-frequency radiation as well as toxic gases. Obama wants this nut job back in power. Zelaya is also buddies with Chavez and Castro. Are you starting to see a pattern here? President Bush met publicly with the Dalai Lama and gave him the Congressional Gold Medal. Obama is the first president to snub the Dalai Lama since 1991. Obama has delayed meeting His Holiness in order to appease the Chinese. Again, siding with the oppressor, not with the oppressed. Oprah said he was the "One". The "One" what? The one to break the most campaign promises in the fastest amount of time? One of the tell tale signs of a sociopath is the broken promises, lies, deception, and hypocrisy. As senator, Obama opposed raising the Debt Ceiling. As President, he is all for raising it, even though as senator he said- "Raising America’s debt limit is a sign of leadership failure". Campaign Obama said he would use public financing like McCain, then as soon as he realized he could make more money privately he broke his campaign finance pledge. Campaign Obama said he would go line by line and veto earmarks...then as president he immediately passes a bill with 9,000 earmarks. Campaign Obama said he would not hire lobbyists and attacked McCain for it...then President Obama fills his administration with lobbyists. Campaign Obama said he would televise the Health Care Bill making process on C-Span, then, a completely partisan bill was done with shady deals behind closed doors. Campaign Obama said he would protect Net Neutrality, then, his own appointed head of the FCC imposes regulations to censor the internet. Campaign Obama said if he were president, he'd be walking the picket lines in solidarity with union workers...then as president he is nowhere to be found during the huge union battle with the Wisconsin Governor Scott Walker. Campaign Obama said he would clamp down on government spending, now, in the words of The Wall Street Journal, “The budget more than doubles the national debt held by the public, adding more to the debt than all previous presidents — from George Washington to George W. Bush — combined." To add insult to injury, he's breaking his promise to not raise taxes on those making less than $250,000. His own administration says Obamacare's mandate for every citizen to buy health insurance is a TAX. And so did the Supreme Court! 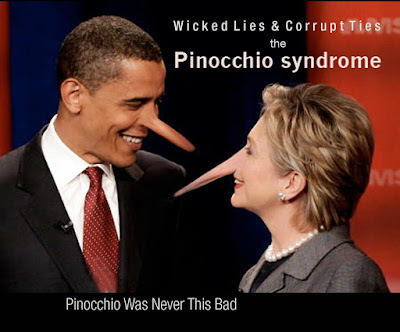 Campaign Obama said, "...number 43 [George W. Bush] added $4 trillion dollars by his lonesome, so that we now have over $9 trillion dollars of debt that we are going to have to pay back -- $30,000 for every man, woman and child, That's irresponsible. 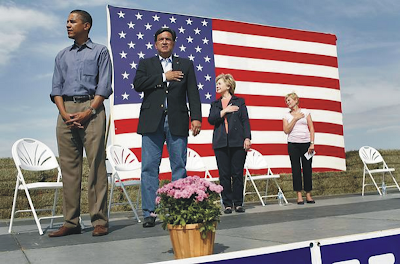 It's unpatriotic,” As of August 2011, President Obama has increased the national debt by $4 trillion and every man, woman and child owes 47,000 dollars and Obama wants to spend more. It's as if Obama 's own words meant absolutely nothing to him. That's sociopathic. 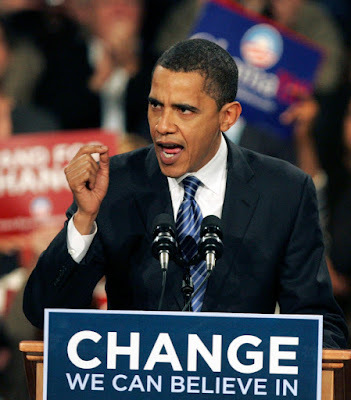 Campaign Obama criticised the Patriot Act as too invasive where Bush allowed the NSA collection of U.S. phone number information IF one of the numbers that connected to a U.S. number was from an overseas flagged number. Yet, as President Obama expanded the Patriot Act so that the NSA could collect ALL phone numbers of Americans, irregardless of an overseas connection. By the end of his first term Obama increased the debt by over 5 trillion. The national debt is now almost 17 trillion. All politicians break their promises, but to break a promise by over 5 trillion in the opposite direction, that's sociopathic. And according to this con man's own logic, Obama is now over 5 trillion more dollars more unpatriotic than Bush. President Obama criticised the "Stand Your Ground" law in a full blown press conference after the Zimmerman verdict. Yet as a state senator he voted for the expansion of the "Stand Your Ground" law in his own state of Illinois. As Senator, Obama was absolutely against the Senate's "Nuclear Option". Now that he's President, he's all in. President Obama said, "If you like your health care plan, you'll be able to keep your health care plan, period. No one will take it away, no matter what." Then, even before Obamacare trotted out it's wretched website, millions of people lost the plans they liked. He's even breaking the promises that the Republicans want him to break like not pulling out of Iraq and Afghanistan as fast as he said he would, not closing GITMO, bringing back military tribunals for terror suspects, extending the Bush tax cuts, etc., etc. All politicians break promises. However, when "one" breaks promises faster than you can redecorate the West Wing, that may be the mark of a sociopath. Obama will promise anything to advance his agenda with a silver tongue. During his January 2011 State of the Union speech Obama said we would cut 400 billion in ten years when the debt in just 2011 alone is projected to be 1.5 Trillion. Again, we know Obama is not stupid, so why would he say such an incredibly, nonsensical thing, unless he just didn't care. A sociopath doesn't care. They will say anything to forward their agenda. Obama also didn't care about the ethics of accommodating anyone that the Chicago political machine wanted him to accommodate. Whether it was campaigning hard for "Pay to play" Blagoyachich for governor, which Obama dutifully did, or fund-raising in unrepentant, murderer and terrorist Bill Ayer's living room and co-chaired a foundation with him. They claim they barely associated with each other yet everybody in Chicago knew Ayer's past. For Obama to play dumb about Ayers is almost as ridiculous as saying he didn't know the views and teachings of his Pastor for 20 years, the radical Rev. Wright. Obama would rather have his own daughters be indoctrinated with ideas like, our government created AIDS to kill black people and purposefully gets them hooked on drugs so it can throw them in prison, or, the USA deserved 9/11, etc.,etc., he'd rather have his own daughters listen to that, than confront the pastor on his teachings. It was more important to stay cool with the black community in order to move up the ranks politically than to take a stand on what is right, even at his daughter's expense. Maybe that shouldn't be a surprise since he doesn't even give his daughters birthday and Christmas presents (according to his interview with People magazine), his child rearing is eccentric. However, his ability to lie with such ease about his knowledge of Rev. Wright, Ayers, and even convicted crook Tony Rezko (partner of Blagoyavich), which Obama had business dealings with, is definitely the mark of a sociopath. 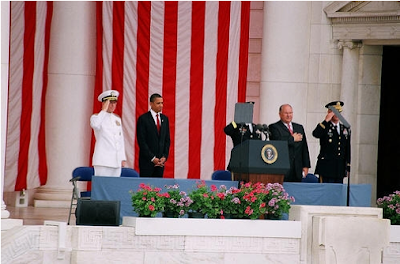 Obama, himself, takes on the trappings of a fascist dictator. Besides taking control of the banks and auto industry, his administration can't resist trying to control the media. Obama's much publicized “Town Hall” on health care turned out to have been, for all intensive purposes, just an infomercial with a tightly controlled audience and a tightly controlled list of White-House-approved questions. No dissenting views or questions could get past the screeners. Right out of the dictator playbook. The Liberal, 40-year White House Press Correspondent Helen Thomas, one of the most far left people out there said, "We have never had that in the White House." And "It’s shocking. It’s really shocking." When someone that liberal dresses down a democratic administration, it adds significant color to the writing on the wall. The fact that Thomas would be the one to scold the Obama administration on how obviously and blatantly it has sought to manipulate the media just goes to shows the level of indifference Obama has to transparency. Especially, when he later tries to exclude Fox News from the White House Press Pool. And his White House communications director Anita Dunn says to the world Fox News is not a real news organization but a wing of the Republican party. Sounds like something Hugo Chavez would say. "This is the most closed, control freak administration I've ever covered." "The Obama administration is far worse than the Bush administration." The Obama White House is "...the most manipulative and secretive administration I've covered." After "Obamacare" was passed into Law, Obama, like a King, arbitrarily made changes to it to suit his political needs. That is unconstitutional. The President is the enforcer of the law, not the maker of laws under the United States form of government. As a Constitutional law expert from Harvard, you'd think he'd know that, or at least care. But he doesn't care, because he is a sociopath. Perhaps, Oprah left Obama's Church because it was distasteful and she didn't need to be obsequious to that community in order to succeed, or maybe she left for some other reason. However, when your pastor of 20 years goes to visit terrorist dictator Col. Qadhafi of Libya with his buddy, radical, extreme racist, and hater Louis Farrakhan (who was given a lifetime achievement award by said pastor), and you still say you weren't aware of your pastor's world view, the lie is becoming comically absurd. Yet, the doozies keep coming. One of the most amusing lies is attached to one of the most poignant revelations of Obama's own world view....his bow to the Saudi King. This is really interesting, not so much because he so readily broke a 200 year old tradition of U.S. presidents not bowing to Monarchs, a core principle upon which this country was founded, but because of his choice of Monarch to which he decided to bow to. Obama nodded as he shook Queen Elizabeth's hand but made an almost 90 degree angle with his body as he took the King's hand. The Saudi King, is the leader of one of the most misogynistic nations on earth. Why does Obama NOT bow to Queen Elizabeth, an empowered woman and stronger ally of the U.S. but deeply bows to an oppressor of women and weaker ally to the U.S.? Even though the Bush family has close ties to the Royal Family, the closest Bush ever came to a bow was ducking his head as a medallion was placed around his neck, not an act of submission. The funny part is how Obama had his staff lie about it by saying he was just reaching for the king's hand, when Queen Elizabeth is shorter than the Saudi King. Some people like to speculate his bowing to the King is because his father was Muslim and a devotion to the customs of Islam (which includes submission to Islamic rulers) are ingrained in him, if that's true, that explains Obama's very curious body language as he reflexively bows, in an almost uncontrollable, knee jerk response at the very moment he encounters the King. That would also explain the no presents for his kids at Christmas time. However, the no presents for birthdays, while may not be sociopathic, it's something deep seated for sure. Obama's values are amorphous and hard to grasp. However, you can judge a man by his associations. Any one of Obama's radical connections by themselves is insignificant. However, when you put them all together you have to recognize the Emperor is not wearing clothes. Other connections Obama has are: Islamic black supremacist, Dr. Khalid Al-Mansour. 9/11 truther, self proclaimed communist and advisor to Obama, Van Jones. Socialist and friend to Farrakhan, Cornel West. Radical Socialist, mentor to Obama, Gregory Galluzzo. Race baiter, Henry Louis Gates. Obama was a lawyer for ACORN which is being investigated for all kinds of criminal activities. And Obama was influenced by "Rules for Radicals" author, Saul Alinsky. 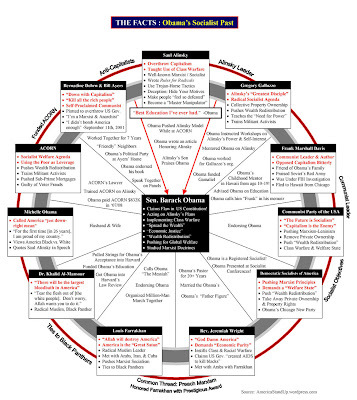 A very cynical guide on how to manipulate the masses. When has an American president ever had so many dubious connections? Another tell tale sign of a sociopath is NARCISSISM. When Obama was a senator he wrote 2 memoirs about himself without authoring his own major legislation on the federal level and not doing much on the state level either. When he was campaigning to be president he changed the seal of the president to his own design. Now, the Narcissist-In-Chief, has mentioned himself 1,200 times in 41 speeches. The New York Times Caucus blog reported: “As of his seven-month in office mark in August, he had done 114 interviews, compared to 37 by former President George W. Bush and 41 by former president Bill Clinton.” Before going on David Letterman he gave a speech at the U.N. where he essentially said to the world now that I am president you can stop bashing America. Why is it that Obama talked to David Letterman more than General McCrystal, commander of the entire Afghanistan war? Because Obama just doesn't care enough. Promoting himself is more important, just like it was with Iraq. He thought with his amazing charm he could get the Europeans to pitch in stimulus money, HE FAILED. He tried to get our allies to put more troops in Afghanistan, HE FAILED. He thought he could get our world friends to give us the Olympics, HE FAILED MISERABLY. However, all of that is not as dangerous as thinking he can charm our ENEMIES, like Mahmoud 'Iwantajihad' to give up nukes. Narcissism can be very dangerous, and like a cough, cannot be hid. He said he didn't deserve the Nobel Peace Prize. Well, he could have turned it down, to pass it on to someone more worthy, but he just couldn't resist taking it. Now Obama is letting his VP Biden and Press Secretary claim that the success in Iraq is due to Obama's leadership. Even though, the Status of Forces agreement to schedule a troop draw down was signed by Bush after a successful surge which both Obama opposed, and Biden rejected as ineffective. The self-inflation is breathtaking. Obama supporters like to praise Obama's intellect and eloquence as if they were virtues. Hitler was extremely eloquent and Carl Marx was quite an intellectual, but that didn't make them right or ethical. Because in the end, knowing what's right, doing the good thing, doesn't come from the brain, it comes from the soul, the heart, and you feel it in your gut. Obama has a brain, but Bush has guts, McCain has guts and Democrat Joe Lieberman has guts, as well as heartiness. Lieberman risked his whole career because of what he felt was right. Bush always used the words "freedom" and "democracy" when talking about Iraq. Yet Obama, on the day our troops pulled out of Iraqi cities (because Bush's surge created enough security and stability to enable that), Obama had no use for those ideals. As the brilliant columnist Charles Krauthammer, said about Obama's comments on this historic day, "He referred to what we've achieved as a sovereign, stable, self-reliant Iraq. He left out one word, and he left it out because it was a George Bush word, 'Democracy'. That was a Bush idea, to implant a democracy in Iraq. If we wanted to have merely a sovereign, stable, self-reliant Iraq, we could have chosen a Saddamist general to succeed Saddam after the war, and gotten out." Obama is an expert at parsing words to suit his agenda, after all he was president of the Harvard Law Review. He's eloquent because all lawyers are trained to be eloquent, but what good is a brain without a spine to hold it up? A spine that doesn't bend 90 degrees in the face of monarchs, dictators and thugs. One thing I think the lawyer Obama doesn't understand is that dealing with dictators is not like a court with rules. Thugs don't respect rules or honor agreements, and while he can comprehend that intellectually, he doesn't get in deep inside, in his gut, or in his heart. Knowing the surge would work is not a brain thing, it's a gut thing, and a heart thing. Siding with the oppressed instead of the oppressors, is a gut thing and a heart thing. The inner moral compass is not in the brain, it resides in the soul. Hopefully, Obama is not too stuck in his head to do some soul searching before his time is up.